Family is the elementary part of a society ore culture moreover parents and children are the pillars of it. Global Day of Parents is celebrated every year to honor parents and their commitment towards their children around the world. The day actually give as a chance to say ‘thank you’, and to show how grateful you are for the , effort and love poured for your successful upbringing and bringing on into normal society. 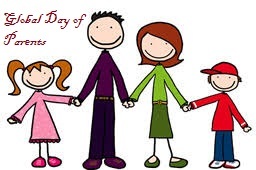 In 1994 Parents' Day was first established because it was a time where society had become more and more self-centered and President Bill Clinton signed a congressional declaration to observe Parents’ Day in an attempt to promote and support family commitment and parental responsibilities. However Parents’ Day is not observed on the same day in every country, but majority of countries in the world it on fourth Sunday of July. 3. Cook dishes that your parents love and enjoy, or traditional family meals.